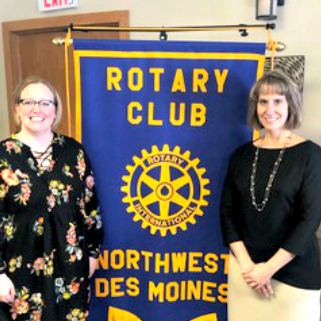 The Rotary Club of Northwest Des Moines recently celebrated an Urbandale CSD educator who exemplifies the 2018 Ken Lepley Memorial Hero in Education Award by demonstrating Service Above Self. Urbandale High School Special Education Teacher, Amber Steel, received the award as a way to celebrate and recognize all of the countless ways in which she supports Urbandale students, staff, and families. The annual Hero in Education Award is presented to an educator who has gone above and beyond the responsibilities of a professional educator. Ms. Steel organizes Best Buddies, a program dedicated to ending the social, physical, and economic isolation of people with intellectual and developmental disabilities. Activities include hosting a talent show, participating in the Friendship Walk and promoting Spread the Word to End the Word. She volunteers many hours on evenings and weekends to make these opportunities available for students. Ms. Steel coordinates the clothing closet. This is a source of clothing for any family in our district. Coordinating this includes partnering with UCAN to obtain clothing donations, helping students sort and organize the clothes, and managing a schedule for families to come in to shop for clothes at no charge to them. She also provides donations to the Urbandale Food Pantry for an off-site clothing closet. She collaborates with other staff members. An example is her work with Mike Moreno in regards to Special Olympics and PEOPLE PE (a PE class where non-disabled peers are chosen to partner with disabled students to participate in accommodated PE activities). Ms. Steel is also a leader of the associates who work in her classroom. Although not required, she has extended a district practice of rounding for use with the staff she works with. This practice allows staff to provide input for improvement and is a mechanism for recognizing good work. The outcome of this practice is creating an improved team culture in her classroom. Urbandale CSD congratulates Steel on receiving this well-deserved award and is grateful for the countless ways in which she supports Urbandale students, staff and families. Well done!